What could be better than a weekend celebrating chocolate and cheese? This past weekend there was a 2 day long Chocolate & Cheese Festival at the Natural History Museum of Utah. The festival featured some of the best local producers of cheese and chocolate, as well as some out-of-town guests, with demos, workshops, tastings, and other hands-on activities. Harmons Grocery teamed up with the museum, and kicked everything off this past Friday with a special event called Chocolate, Cheese & Cheers, which I was honored to be asked to cook for. There were different stations which paired a different cheese and chocolate company together. The guests got to taste different cheeses and chocolates from those companies, as well as a chef’s creation using one of those cheese and chocolate together. I was assigned Sartori Cheese and Omnom Chocolate and asked to do a savory dish. I went back and forth on what to do and did an initial trial run on a mole-inspired pork shoulder, but wasn’t in love with it. Then inspiration hit and I whipped up a dish inspired by some of my favorite bites from my time living in Memphis, Tennessee. 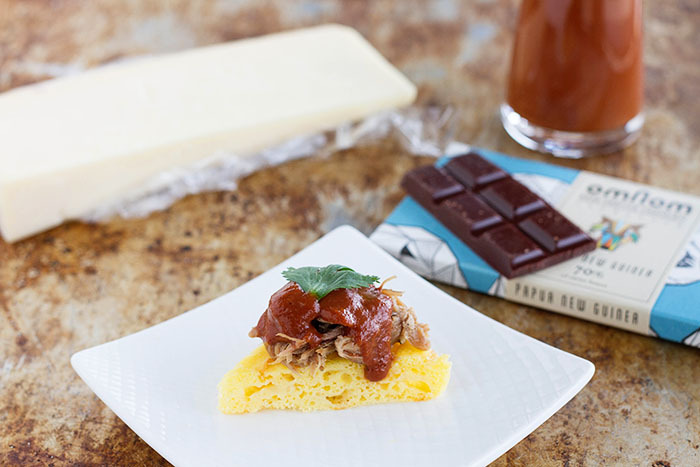 I settled on a slow-roasted pulled pork topped with a chocolate barbecue sauce and served on a savory cheese corn cake. 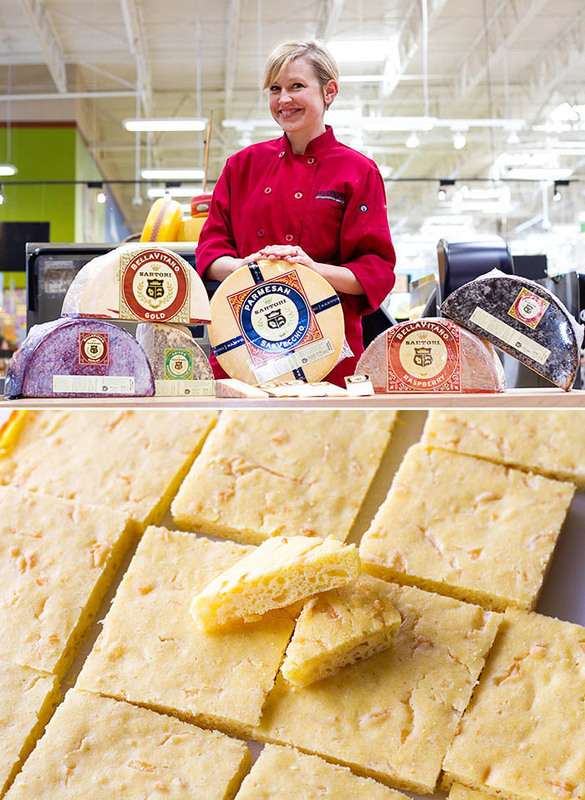 In choosing which cheese and which chocolate I would use, I employed the help of Karin, one of the Cheese Mongers at my local Harmons Grocery store. I think Karin groans when she sees me coming. I’ve been teaching classes at their cooking school about once a week lately, so between teaching and shopping, I’m there a lot! Plus, let’s be honest, the Cheese Island is amazing. I recently asked, out of curiosity, and was told that they carry about 325 cheeses, as well as over 90 chocolate bars, drinking chocolate, and cacao teas, and are always adding new things. 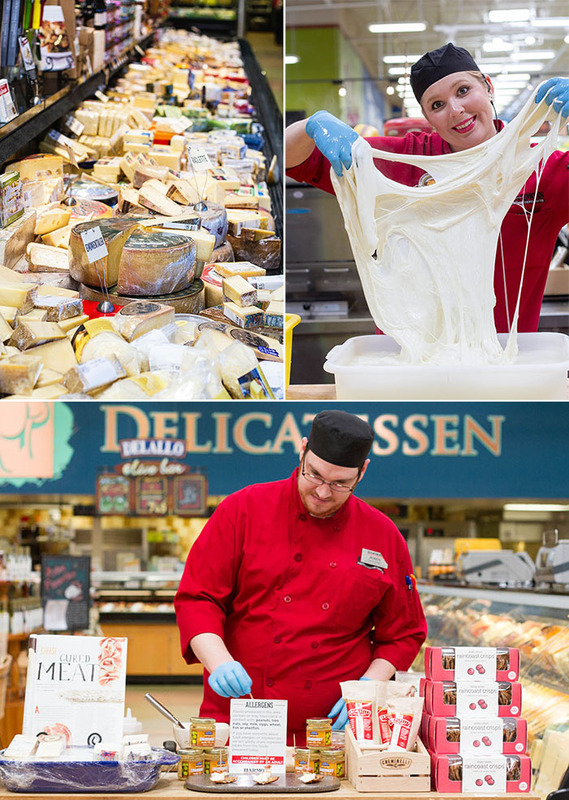 Plus, they make fresh mozzarella, fondue cheese blends, and parmesan crisps in the store. You can get a sample of any product carried at the Cheese Island just by asking for a sample, and the Cheese Mongers are super helpful if you have any questions or need help pairing things, want cooking ideas, etc. So to say that I take advantage of these services might be an understatement. I’m getting spoiled living so close to one. Karin gave me samples of a bunch of Sartori cheeses and Omnom chocolates and we picked out a cheese and chocolate that would taste good together. So thank you Karin for all of your help and your patience! For my cheese I chose Sartori’s BellaVitano Gold cheese, a creamy cheese that was inspired by a traditional, Italian farmstead cheese. When you first put it in your mouth it tastes a little bit like a Parmesan cheese, but the texture is smoother and creamier, like it was mixed with melted butter. SO GOOD! I finally shredded it and folded it into the batter for my corn cake, the sprinkled a bit more of it on top of my corn cake just after it came out of the oven. For my chocolate I chose Omnom’s Papua New Guinea which is a 70% cacao chocolate made from organic cacao beans from Papua New Guinea. The chocolate is rich and velvety with a smoky flavor that made it perfect for putting into a barbecue sauce to serve with my pulled pork. I was really proud of my finished dish and couldn’t wait to share it. When I took these pictures I garnished the dish with a fresh cilantro leaf, but after a few more recipe tweaks, a few slices of scallions tasted better, but you could really choose to use either one! 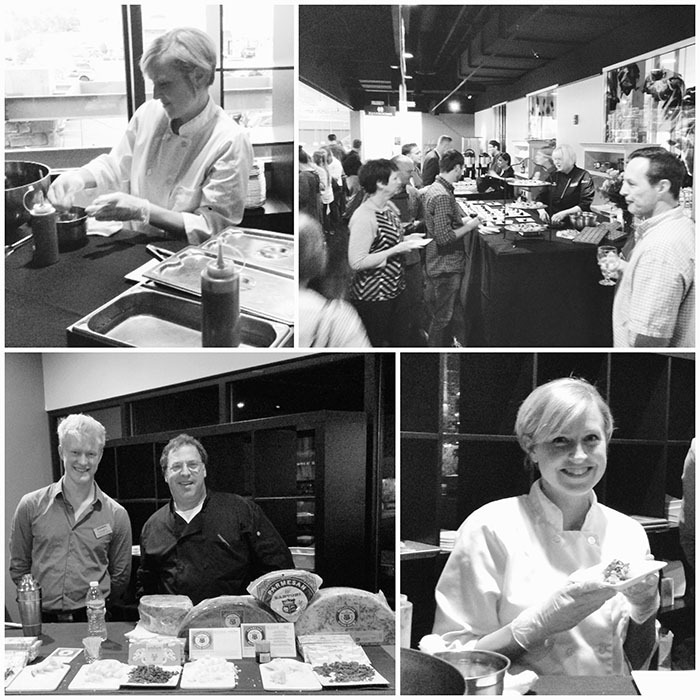 The evening was a blast—we had about 100 people in attendance, all of the food was amazing, and I loved getting to work alongside Jim Tassielli, a longtime cheese monger and now the area sales manager for the Northwest region for Sartori cheese. 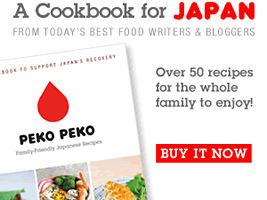 I thought it would be fun to share a bit about the evening and my finished recipe. This is my take on some of my favorite Memphian comfort food. You can serve it, like I did for the event, as an appetizer, or serve it up with some baked beans and a green salad as a main dish. It will be delicious either way! 1. Make the pulled pork: Pierce the pork roast all over with the tip of a sharp knife. Place the roast in a 6-quart slow cooker and rub both salts all over the meat. Drizzle the liquid smoke over the meat. 2. Cover the slow cooker and cook on low heat for 14 to 16 hours, turning the roast over once half-way through the cooking time. When the meat shreds easily with a fork (and is basically falling apart by itself) it is ready. 3. Remove the meat from the slow cooker and chop into chunks that are about 3 inches wide, then shred the pieces slightly. Add drippings from the slow cooker as needed to moisten the meat. 4. Make the chocolate barbecue sauce: Melt the butter in a medium saucepan over medium heat. Add the onion and cook until it softens, about 5 minutes. Then add the garlic and cook until it is fragrant, about 30 seconds. 5. Add the tomato sauce, cider vinegar, rice vinegar, molasses, Worcestershire sauce, mustard, hot sauce, salt, black pepper, and ancho chile powder, and stir to combine. Bring the sauce to a boil, then reduce the heat to low and simmer, stirring occasionally, until slightly thickened, about 15 to 20 minutes. 6. 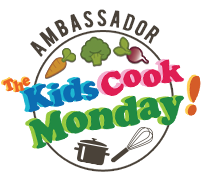 Transfer the sauce to the jar of a blender and blend until smooth, then return the sauce to the saucepan. Let the sauce cool slightly, then add the chocolate and stir gently until it has melted and has been incorporated completely (you will no longer see streaks of it in the sauce). 7. Make the cheese corn cake: Preheat the oven to 400 degrees Fahrenheit. Lightly grease a rimmed baking sheet, then line the bottom with parchment paper. 8. In a medium-size bowl, whisk together the corn flour, all-purpose flour, granulated sugar, baking powder, and salt. In a large bowl, mix the eggs and butter together. Add the corn flour mixture, and mix briefly until the mixture is starting to clump together. Add the buttermilk and mix until just incorporated. Add the shredded cheese and gently fold it in. Pour the batter onto the prepared baking sheet and use a spatula or offset spatula to spread the batter out over the entire baking sheet and then level it. 9. Bake the corn cake in the preheated oven for 16 minutes, or until the edges are golden brown. Remove from the oven and sprinkle with additional cheese, then let the cake cool. When it has cooled, or is just barely warm, remove the corn cake from the baking sheet and peel off the parchment paper. Cut the corn cake into pieces. 10. 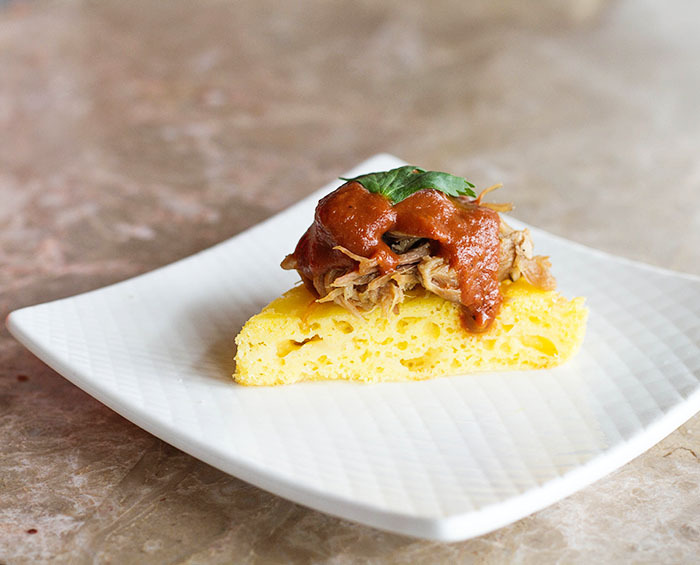 Serve: As a main dish, spoon the barbecue sauce over the meat and serve with pieces of cheese corn cake. As an appetizer, top pieces of corn cake with shredded meat, drizzle with barbecue sauce and top with a few slices of scallion. 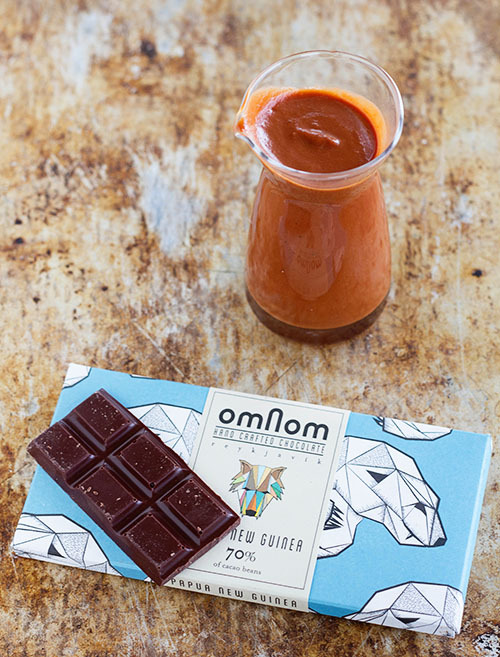 *Recipe Notes: I really recommend using both the Omnom chocolate and the Sartori cheese, but if you must use substitutes, you can use another high-quality 70% cacao chocolate and I would probably lean towards something like a Jarlsberg cheese that will provide some of that same creaminess and nutty flavor. If you make the barbecue sauce ahead of time, wait to add the chocolate. When you are ready to serve it, gently reheat the sauce until it is warm, but not hot, then stir in the chocolate. The sauce can be reheated, but the texture changes slightly in doing so. 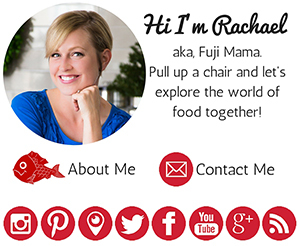 *Disclosure: I am a guest cooking instructor and blogger for Harmons Grocery and am being compensated for this post. All opinions and experiences, however, are my own! This looks so good! I never would have thought of adding chocolate to barbecue sauce, but now I am dying to try it. My boys love corn bread, so I know they’re going to love this corn cake. I was hoping you were going to post this. We were there Friday night and this was unreal. When we came to your booth and you were describing it I thought it was going to taste super weird. My taste buds were in shock because it was so killer good. Love it Mamma. It was so much fun working with you. such awesome ideas. Sat and ate a 1/3 of the bar of Omnom yesterday for lunch..
You’ve captured this peerlctfy. Thanks for taking the time! Yes it takes longer using the usb port 2.0..Using the supplied wall adapter takes 1/2 the time..U also use the same usb cable for your charger adapter that is provided with your camera.. have a good day. Previous post: Chocolate Chip Pecan Brownie Pie—Happy Pi(e) Day!